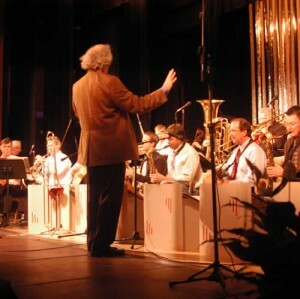 Vaughn Wiester’s Famous Jazz Orchestra has a new home at the Clintonville Woman’s Club at 3951 North High Street in Columbus Ohio. This venue is located right next to the Whetstone Park of Roses in Clintonville. The Orchestra’s last show at the Columbus Maennerchor was late April and the band worked vigilantly to seek out a new venue. In fact the band enjoyed a three week vacation in May, Vaughn’s first since starting the band over fifteen years ago! Now fans of Vaughn Wiester will be able to enjoy the music once again each Monday night starting at 7:30pm at the Clintonville Woman’s Club. The opening night for the weekly jazz showcase is Monday, June 6th.